Collage Photo Frames - a photo of a loved one in the frame. This program - a widget for your desktop. 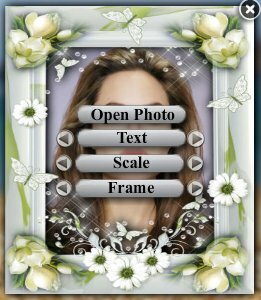 Put a photo of a loved one in a beautiful photo frame on the desktop. Widget replace your desktop photo and create a home-like atmosphere. You can choose a photo of your loved one, your photo or a photo of a beloved pet. 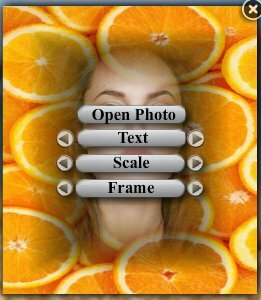 Click - open photo, and then select the photo you would like to see. Then use the buttons - scale and arrows - select the scale of the widget on the desktop. You can also add any text - signature - under the photo. To do this, click on button - text. To zoom text - press the arrows - left and right next to the text. Use the arrows and the frame - choose any liked the photo frame from the base of the photo frame. You can choose from more than a dozen beautiful photo frames. The widget is easy to move the mouse in any part of the screen. The program will automatically run when you start windows. In order to run it on their own - to remove the program from the Startup folder.